Some experts believe that Sino-Indian trade through Nathu-La will not only benefit Sikkim, it will boost economic activity in the entire eastern region, including the north-eastern states. But can trade through the highest road pass in the world help solve the problems of a region where trade is almost non-existent? 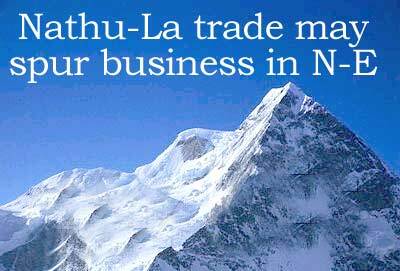 Nathu-La can lead to the north Bengal town of Siliguri turning into a trading hotspot. The town, located at the foot of the Himalayas and well connected by road and rail, operates as the transshipment hub for the North-East and northern Bihar today. Tomorrow, it can be the transshipment point for all trade through Nathu-La. "Siliguri will be the transit point for Tibet trade as it is well linked by rail and road. Moreover, it can be the hub connecting all the major Buddhist destinations in India � Bodh Gaya in Bihar, Rumtek in Sikkim and Tawang in Arunanchal Pradesh -- to Lhasa in Tibet," Sabyasachi Sen, principal secretary for commerce and industry in the West Bengal government, said. The choice of Siliguri and its twin city, Jalpaiguri, as the point for Customs, warehousing and storage, and freight handling infrastructure seems obvious as it is also on the East-West Corridor of the National Highway Development Project. It is ideal for switching cargos to more powerful trucks capable of crossing Nathu-La at 14,500 feet. Moreover, being in the plains, building infrastructure will be less expensive. Whether Siliguri will be able to take the burden is another question. Sen said the state had asked Siliguri-Jalpaiguri Development Authority (SJDA) to work out a detailed plan. "We have told them to spell out their requirements," Sen said. He emphasised on a partnership with Sikkim to move ahead. "West Bengal Chief Minister Buddhadeb Bhattacharya has written to Sikkim Chief Minister Pawan Chamling proposing a joint action group to monitor the development of the Nathu-La trade route," Sen said. The two states hope to approach the Centre jointly once all the plans are in place. The Kolkata and Haldia docks are the ports closest to China's southern region.� At present, the entire area is bottled up and has to do trade via Myanmar ports, 5,000km away. Kolkata in contrast is 1,200 km. So the obvious beneficiaries of the Nathu-La trade are likely be the port at Kolkata and Haldia. Kolkata Port Trust chairman Anup Chanda is upbeat about the possibility. "The new trade route will augur well for us. We are ready to handle any additional cargo that may come from Tibet," Chanda said. The port trust is repairing infrastructure both at Kolkata and Haldia docks to handle additional cargo. Moreover, it has embarked upon a project to develop cargo handling in deep draft areas at Saugor Island and Sandheads. Kolkata and Haldia are plagued by low draft caused by silt deposition on the river bed. Saugor and Sandheads offer much higher draft capable of handling very large ships and crude oil carriers.� Within Kolkata, major steps have been taken to improve rail connectivity with other region. The port has ended its long tiff with railways to work on a new container handling facility at Kolkata docks which Container Corporation (Concor) will manage. Concor will set up a modern container handling facility within Kolkata Dock System. Moreover, the port has entrusted Eastern Railway to spruce up 78 km of rail tracks within the dock area to move other break bulk cargo. Cargo can now move between Kolkata and Siliguri by rail directly and switch modes between rail and ship. The road between Kolkata port and Nathu-La is a major headache. West Bengal has been sitting for years on a project to improve connectivity along part of the National Highway 34 between Siliguri and Kolkata. One 300 km, Rs 1,085 crore (Rs 10.85 billion) project will be funded with a Rs 698 crore (Rs 6.98 billion) loan from Asian Development Bank, Rs 329 crore (Rs 3.29 billion) from the central government and Rs 57 crore (Rs 570 million) from the state. It will take care of only 300km of the 600 km distance. Also, it is way behind schedule- a consultant for preparation of the detailed project report is yet to be appointed, and the project can be completed at the earliest in June 2007, says the central road transport and highway ministry. Hmm... good, but i hope all this doesn't kill the sanctity of these beautiful places.